Brian: You could have been a well-paid physicist, living in style in Mumbai. What first inspired you to focus on environmental activism instead? Vandana: Even while doing physics I had got involved as a volunteer in the Chipko movement that stopped logging in my home region in the Himalaya. In 1982 the Ministry of Environment asked me to assess the impact of mining in Doon Valley. The study led to a Supreme Court case and the mines were shut down. I realized then that I could contribute much more outside formal research systems, and started the Research Foundation for Science Technology and Ecology. In 1984, as a consequence of the Bhopal disaster and Punjab violence, I undertook a study for the United Nations University which was published as a book The Violence of the Green Revolution. In 1987 I was invited to attend a conference on Biotechnology, and hearing the agrochemical corporations talk about how they needed to do genetic engineering to claim patents, and how they were working on an international Intellectual Property Treaty in the GATT – which became the WTO – I made a commitment to save seeds, and build movements on Globalization, patents on seeds, and GMOs. Brian: You’ve written that quantum theory taught you guiding principles for your life’s work? How so? 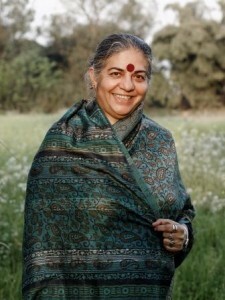 Vandana: The quantum principles that have guided my life’s work are non-separability – separateness is not the nature of reality; the world is interconnected. Potential – potential is the nature of reality, not fixed and immutable particles. Everything has potential to evolve. Indeterminacy – because the world is not made of fixed determinate quantities and things, but is a fluid enfolding and unfolding of potential, indeterminateness and uncertainty. Uncertainty – is the nature of being. No excluded middle, no either or. Brian: You’ve said that “in the soil are the answers to the problem that oil has created”. What is your top priority in the Year of Soils? Vandana: My priority in the Year of Soils is to create awareness about – and love and reverence for – the living soil that supports and sustains us. We have started working on a Manifesto on Soil that will be released at the Expo in Milan which is dedicated to feeding the world. We are preparing a film of Living Soil. In September we will offer a course on A-Z of Agroecology dedicated to training in living soil and living seed. On 1st October we will organize a festival dedicated to the Soil. And from 2nd October to 5th October we will organize a Soil pilgrimage. Hope your readers can join. Brian: Why is “Seed Freedom” so important to you? Vandana: Seed is the first link in the food chain. In seed is embodied millions of years of evolution, and thousands of years of breeding by our ancestors. In seed lies the future potential of agriculture. Seed freedom has become the most significant commitment of my life because of the threat of genetic engineering, the imposition of patent laws and seed laws that are trying to make seed saving illegal in order to establish a corporate monopoly on seed. In India, high costs of seed and chemicals have pushed farmers into a debt trap. More than 291,000 indebted farmers have committed suicide. When farmers have their own seed, they have no debt. For the freedom of seed, of biodiversity, of farmers, of citizens, we all need to be engaged in Seed Freedom. Brian: Contamination of organic crops by GMOs from neighbouring farms is a serious concern. What can be done? Vandana: Genetic pollution of organic farms by GMOs is a new form of pollution. Environmental laws recognize that polluters must pay. In the case of GMOs corporations like Monsanto – which define seed as their intellectual property – should pay. UN Biosafety laws have a liability protocol. This should be implemented by every country. Brian: What is your attitude to “corporate personhood” – granting corporations the status of legal “persons”? Vandana: When corporations claim personhood, they rob citizens of their personhood. When citizens of Vermont were successful in having a labelling law passed, corporations sued Vermont on grounds of their “personhood”. They have tried to argue that citizens knowing what is in their food, and making choices on the basis of that information is taking away the “Free Speech” of the corporate person. The Investor State Dispute Settlement clauses in the New Free Trade treaties such as TPP and TIPP are in fact clauses of corporate personhood through which corporations want to have rights to sue governments that act in the public good on the basis of democracy. The rise of corporate personhood is the death of democracy, the death of sovereignty, the death of human rights, the end of freedom. We cannot allow this fiction to become the basis of governance. Brian: Food security is a focus for you. But you also stress the importance of organic production in non-food crops such as cotton. Why is that? Vandana: I have witnessed cotton farmers getting trapped in debt as a monopoly of Bt cotton was established. The highest number of suicides are in the cotton belt. We have carried out research on soil and found beneficial organisms killed with Bt cotton. We are doing a study on pollinators. There are no pollinators in Bt cotton fields. To protect our ecosystems, our biodiversity, our soil, our farmers we must promote organic cotton. Farmers using native cotton seeds from Navdanya seed banks and practicing organic production are getting double the yield and up to ten times higher incomes. They are also growing organic food crops and organic kitchen gardens we call Gardens of Hope. Since the organic cotton project has freed farmers from debt, we call it Fibres of Freedom. Brian: Thank you so much Vandana. We very much look forward to hearing more from you at WOMADelaide. This entry was posted in Activism, Environment, Food, Technology, World Health and tagged activism, cotton, economics, environment, food, future, GMOs, india, organic, seeds, soil, sustainability, WOMAD, WOMADelaide, Year of Soils by Brian Loffler. Bookmark the permalink.